Mason Raymond's path to Vancouver went through Camrose. Raymond had a big affect on the Camrose Kodiaks and the Alberta Junior Hockey League team has decided to pay him the highest tribute. The Kodiaks had an equally impactful affect on Raymond and he can’t wait to thank the organization. The Kodiaks recently announced that Raymond’s number 9 will be retired in a ceremony prior to the team’s home opener against the Okotoks Oilers on September 10th at the Edgeworth Centre. “It’s an honour, it’s exciting and I’m already sensing the nerves I’ll have on the actual day,” said Raymond, who will attend the ceremony and take time to visit schools during his stay. Raymond laced up his skates in Camrose for two seasons from 2003-2005 and to say playing for the AJHL team was an exciting time in the then 18-year-old’s life would be false. Jumping from the Strathmore Bisons of the Foothills Bisons Hockey Association to the Kodiaks was a monumental move, one that forced Raymond to accelerate his maturation and really grow into his own. “I had heard a lot of good things about Camrose, they’d had a lot of good Junior A teams and that made things a little easier, but that jump was a big one. I moved out of the house, left mom and dad, and moved in with billets. 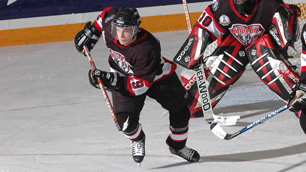 In his first season with the Kodiaks in 2003-2004, Raymond scored 27 goals and had 62 points in 57 games to lead the team in scoring and finish 16th in league scoring. Raymond didn’t set any league records like the infamous Happy Gilmore (most time spent in the penalty box and the only guy to ever take off his skate and try to stab somebody), but the Kodiaks benefited from the boost in scoring and finished in top spot in the AJHL standings. The following season Raymond scored 41 goals and had 41 assists for 82 points in 55 games as Camrose finished first for the second consecutive year. The Kodiaks rode a franchise best 48-8-8 regular season record into the post-season and they didn’t take their foot off the gas advancing to the RBC Cup for the third time in five years. Unfortunately, unlike in 2001 when Camrose knocked off the hometown Flin Flon Bombers to win the National Junior A Championship, Raymond’s 2005 team mimicked the 2003 Kodiaks and came up short in the championship. Like they teach you in novice, winning isn’t everything. For Raymond, the experience opened his eyes to a whole new world. “All those games felt like game seven playoff games, a lot like in the NHL. We were down 3-1 in the AJHL final and came back and won it 4-3. Those seven games alone really felt like a war with all the bruises and bumps, and winning that AJHL championship was something special. For his efforts during the AJHL playoffs, Raymond was awarded the league’s Most Valuable Player Award. That June, the Canucks selected Raymond in the second round of the 2005 NHL Entry Draft. This past July, just over five years since Raymond was taken 51st overall by Vancouver, the Canucks re-signed the forward to a two-year contract. He’s no longer living with billets, no longer frosting his tips and no longer trying to make a name for himself. Raymond’s speedy offensive game is known throughout the NHL, just as he hoped it would be. Camrose coach and general manager Boris Rybalka played a major part in that and he continues to help Raymond when he needs guidance. 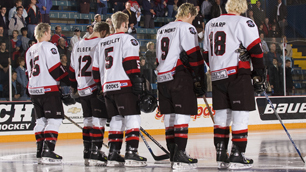 The respect is mutual from coach Rybalka, who has been involved with the Kodiaks throughout the franchise's 11-year history. Special thanks to Darcy Steen (Camrose Kodiaks), Andy Devlin (Hockey Canada) and Matthew Manor (Hockey Canada) for the photos.